Its fireplace-warmed lobby free hot breakfast and heated indoor pool earn the Hampton Inn Laramie serious points from our guests. The three-story 84-room Hampton Inn offers a cozy lobby furnished with leather sofas and a fireplace. Each room has free high-speed internet access a 27-inch TV and plenty of places to plug in gadgets. The hotel provides a free breakfast buffet each morning complete with hot and cold options. The business center has your back with fax copy and printing facilities. When you get some downtime the indoor heated pool hot tub and fitness facility come in handy. There's even an on-site laundry facility which can be a lifesaver on the road. Parking is free. 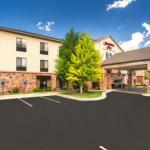 The Hampton Inn is three miles from downtown Laramie and one-and-a-half miles from the University of Wyoming. Bamforth National Wildlife Refuge is 45 minutes from the hotel. Laramie Regional Airport is eight miles away and Cheyenne Regional Airport is 49 miles.